First of all, let me say how delicious and easy this salad was! I've been on a salad-kick for the last few weeks, trying to get back into "pageant" shape, and I stumbled across this delicious recipe (from Pintrest, posted below) for Edamame Salad. I personally love edamame- it is packed with protein and nutrients and is nice and filling. Combining it with all of these simple ingredients made it even more delicious, and it was a nice change-up from the typical lettuce/spinach salad I eat every other day! First, I began my chopping up all of my ingredients. 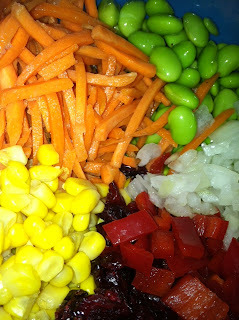 The great thing about this recipe is that all of these vegetables can be used again on future salads (if you have leftovers) or on another batch of Edamame Salad! 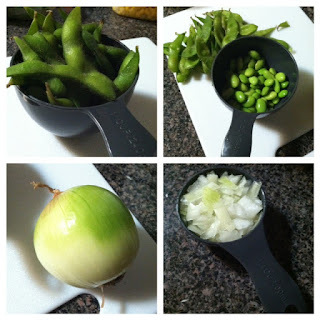 Steam and shell the Edamame, dice the onion and rinse in cold water! Combine it all in a bowl- so colorful! 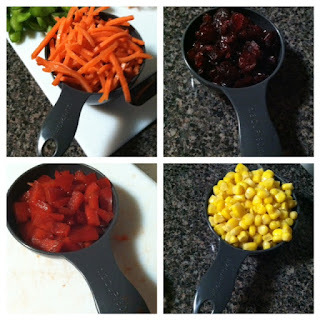 After you have chopped everything, combine it in a bowl and prepare your salad dressing. I actually designed my own salad dressing because I didn't have some of the ingredients listed on the original recipe. I had olive oil and balsamic vinegar in my cabinet, so I decided to use these with the brown sugar that the original recipe calls for (you could also try honey or agave nectar). Mix together your 2 T. of olive oil, 1 T. of balsamic vinegar, and 1 t. of brown sugar in a small container. 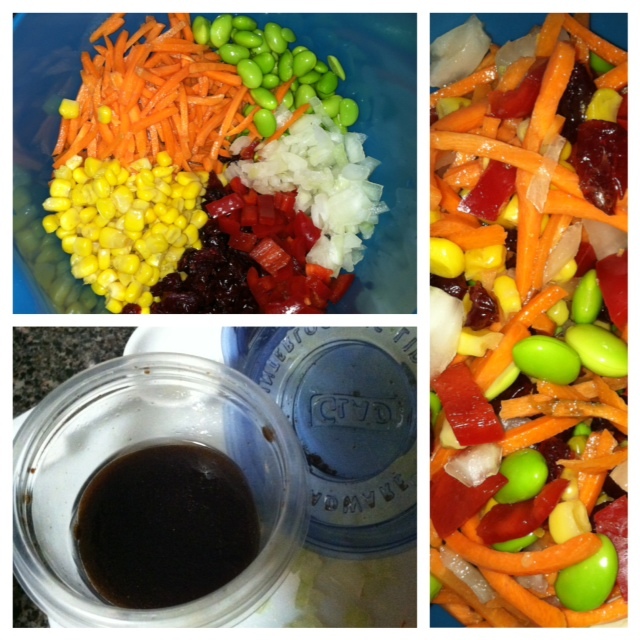 I used a mini-tupperware that I usually use to store dressings in! And just like that, you are done! Time to enjoy! I would save the dressing to pour on with each serving (rather than pouring it all on at once) so that it doesn't get gross. The original recipe actually called for 6 T. of olive oil...... I only used 2 T. and never even finished off the dressing! So use your judgement on how much dressing you usually like. This is the original recipe from which I got the idea! yummm! I'm making this as we speak because I always have these ingredients on hand. 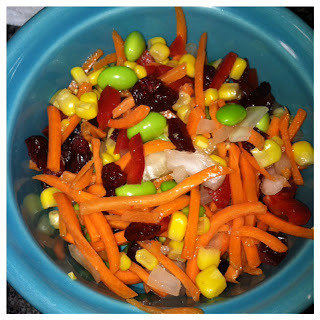 I make one similar all the time with edamame, dried cranberries, walnuts, cilantro, and lime juice. I just saw that you have a blog and I've been reading every post! keep it up I'm all about this stuff and love what you have to say since you know what you're talking about! I'm so proud of you and everything you're doing!